Approximate Debt + Interest Since V.C. A vehicle’s in-dash instrument cluster provides its driver with critical information. 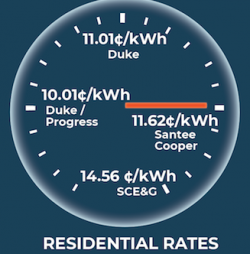 Here’s Palmetto Promise Institute’s assessment of critical information that all Santee Cooper customers – and all South Carolinians – should know about the state-owned utility. As a government-owned entity without shareholders, Santee Cooper customers, the “ratepayers,” are on the hook for the entire amount of this debt. = Unlike other utilities, Santee Cooper is owned by the South Carolina state government. As a result, the agency is not subject to oversight by the Public Service Commission. = According to the U.S. Energy Information Administration, coal was responsible for 30.1% of U.S. electricity generation, natural gas and oil were responsible for 32.2% and renewables were responsible for 17.1%. Santee Cooper has reported that it relies on coal for 42% of its generation, natural gas and oil for 25% of electricity generation and only 2% renewables. = The V.C. Summer nuclear project was anticipated to generate 2200 MW of electricity that will now never be produced, but which Santee Cooper customers are on the hook to pay for. = Santee Cooper owes $14.9 billion in principal and interest, about half of which is for V.C. Summer debacle. 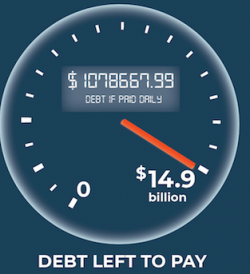 Debt is calculated at more than $1 million per day. = If things remain the same, Cooper customers will be paying off the V.C. Summer debt for the next 38 years, burdening multiple generations of South Carolinians. = A PPI economic analysis estimates that rates will need to increase a minimum of another 13.7%[vi] to service the debt. Based on Santee Cooper rate projections, increases of 12.2% are needed. [vii] We expect PPI’s higher projections could prove more accurate over time. [i] Source: Santee Cooper Investor Relations website: Debt Service Schedule 2018. [ii] Aggregate debt divided by 38 years divided by 365 days per year. [iii] On September 30, 2018, the total number of days was 426. 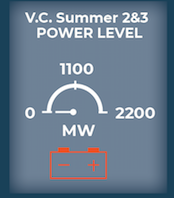 This figure is calculated based on 2018 numbers from Santee Cooper Investor Relations website, so the actual number for August 1, 2017 to September 30, 2018 could be slightly higher. [iv] South Carolina Energy Office calculations based on U.S. Energy Information Administration data. [v] 15.2% calculation based on rates announced in Santee Cooper news releases (2012 to present) compounded. [vi] Santee Cooper Rate Increase Projections, 2018 Update, Palmetto Promise Institute. [vii] Calculated from Santee Cooper slide presentation to Public Service Authority Evaluation & Recommendation Committee, September 5, 2018.